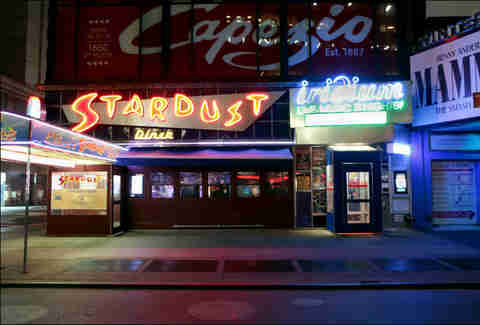 It’s 6 o’clock on a Saturday night, and nearly everyone packed into Ellen’s Stardust Diner -- the neon-lit bi-level Broadway-themed eatery on the corner of 51st and Broadway -- is an adult. 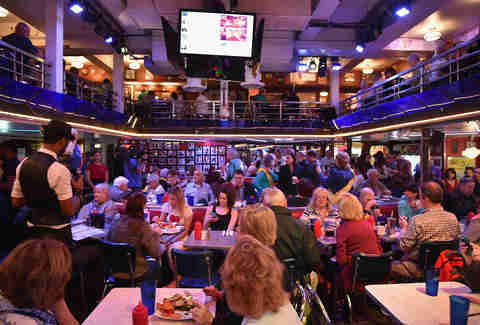 Two women belt out Rent’s “Take Me or Leave Me” from the narrow catwalk-style stage in the middle of the dining room, while an audience of grilled cheese-eating diners cheers along. Nearby, two servers debate the difference of Russian dressing vs. Thousand Island (one has relish, right?) while browsing a set list to see who’s up next. A server, whom the MC announces recently returned from Italy, says he’s going to sing a classic the audience will “really like.” He prances out in a long blonde wig to the familiar chords of Shania Twain’s “Man, I Feel Like a Woman.” Confetti curls from the balcony, straw wrappers are thrown in glee. This may be the happiest place in New York. 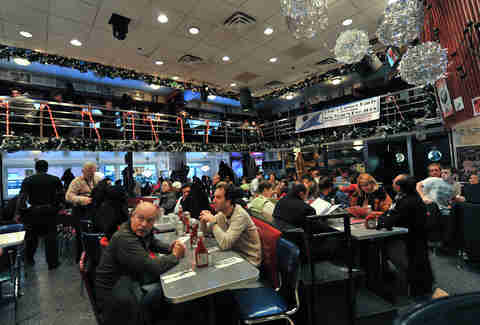 As a reporter, I skip the line of hoodie-clad, Playbill-clutching tourists curling around the blue-tile plated diner to snag a seat at the bar. As a New Yorker, I’d never think of setting foot in here, but I’m hooked. Sure, the food is overpriced (a grilled cheese goes for $14), there’s a substantial wait outside (the same can be said for dozens of additional restaurants that are “cool” to stand in line for), and the restaurant is in the heart of Times Square -- but during my stay here, I text at least two dozen people, promising to take them all to this joyous, over-the-top place. In some ways, it feels like a tourist’s best-kept secret. In 2016, Ellen’s made headlines for unionizing, a rare feat for diner employees, but a common one for actors who must maintain union status in the Actor’s Equity Association (AEA) or Screen Actors Guild (SAG) in order to work in or audition for certain roles. The controversy over unionization has since settled. Business (both show and restaurant) has returned to normal at Ellen’s, which continues to staff a slew of insanely talented performers, many of whom have appeared on Broadway to belt out ballads and pop hits between serving Love Me Tenders (that’s chicken tenders served with both onion rings and waffle fries) and refilling cups of water. Yeah, it’s fun enough to patronize this flamboyant establishment, to partake in the fantasy for a minute. But what’s it actually like to work here? To audition for the role of server (sometimes secured through casting calls, but, like anything else, more likely if you have personal connections) prospects stand in front of the dining room and sing for an audience of diners. Auditionees prepare songs of their choosing (and songs off a list selected by the management) and then perform a song selected off that long list. Ellen’s artistic director, Scott Barbarino, evaluates the performance and singer’s interaction with the crowd. If it feels like a fit, potential servers will move on to a more traditional service job interview and then progress to training. Because Ellen’s servers are already professional (or nearly professional) performers, they prepare songs on their own time. By Day 3 of the five-day training and shadowing week, new servers are expected to perform. The final day of training leaves a new server in charge of his or her own section. It may not go well; many can’t catch the rhythm of belting out show tunes and remembering how guests like their burgers cooked. “It’s insane. It’s crazy, busy chaos,” Danny Brooks says of the plunge into multitasking. But obviously a special few -- he among them -- do make the cut. 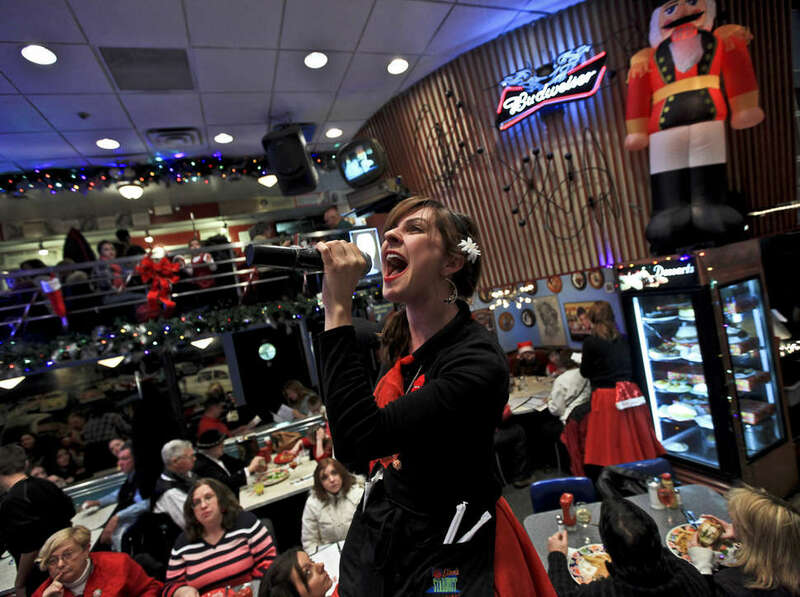 Brooks has been a Singing Server at Ellen’s Stardust Diner since 2015. The actor-singer started as a host to work his way up to the tough-to-secure audition. That eventually landed him a spot among the singing servers, many of whom have had leading roles on Broadway and in nationally touring productions. Thanks to the capricious nature of show business -- you can be starring in a Tony Award-winning production one day, and bussing tables the next -- the level of talent working at Ellen’s is extraordinary. A performer since his childhood outside of Chicago, Brooks moved to New York after theater school to become a working actor. So far, he has scored background roles on Quantico and Homeland -- but he relies on his job at Ellen’s for a steady income. Brooks wakes up early each morning to check Backstage for audition listings (access to the network of successful Ellen’s alums only gets a Broadway aspiree so far), dropping into one -- or two or three or four – before hitting the gym and going to work to sing for nine hours and balance milkshakes with mini bottles of Fireball on top on his tray amid the pandemonium. The work is nonstop. At the diner, where Brooks clocks in just before his shift starts, he starts his set with a warm-up song -- “something easy, not too high,” he says. Having warmed up his voice already in the morning, Brooks sees where his range is at for the day (on a recent evening he kicked off with Frank Sinatra’s “New York, New York”). While servers perform, a floater covers their tables, should food be ready or a guest need an extra straw, so they’re not technically plunking down Mama Mia Meatloaf while belting out “Dancing Queen” -- but it’s still a lot to juggle. As soon as Brooks wraps his number and removes his costume sunglasses, he’s back at the point-of-sale system, checking in on orders and bringing a tray of ice water to a table in the back corner. The set list is built every morning. It alternates between men and women, from the main floor to the mezzanine, and builds a flow of slow and fast songs, with that strategic pre-bucket song really hyping up the audience. Between the sets, tracks by Destiny’s Child and RuPaul keep the energy up. From the moment it opens at 7am, Ellen’s is pretty much always packed. Some groups stop by for a quick slice of rainbow cheesecake before a show. Others, like a group of older gents in a booth on a Saturday night, linger for hours, ordering $8 beers all night. It’s mostly tourists Brooks serves at the tables, and plenty of adults come without kids. People tend to be polite, but a common question -- which show he’s currently in -- grates on him. “I’m like, ‘Well, I’m working here, so I’m not in one, I’m sorry,’” he says. There can also be a weird intimacy that develops when your server is singing ballads in front of your table. A group recently asked Brooks to cut their hamburger in half, as if he were their parent. That was also a no. Once servers are officially on the schedule, they still have to grind through songbooks in their own time. The singing servers are required to know and perfect the undyingly popular Les Misérables, Beauty and the Beast, Grease, and Mamma Mia soundtracks. On occasion, co-workers meet up in their apartments or at Midtown’s NOLA studios to put together a duet or group number. A lot of diners make requests. “We’re not a jukebox, we don’t know everything,” Brooks says, “But we’ll try to see if we can.” Guests love to hear songs from Hamilton (which Brooks sings) and Dear Evan Hansen -- two shows notoriously difficult to score tickets for. Wicked is also in high demand. During a recent visit, I watched a former Broadway Elphaba sing one of the character’s songs, “The Wizard And I,” much to the enjoyment of two levels of guests seeing an actual former Broadway performer sing her role. For what it’s worth: Ellen’s has yet to run into any licensing issues. Songs are sung to karaoke tracks they purchase from iTunes. Ellen’s servers are paid New York City’s standard server (or host) wages. The only compensation they get for singing is from a bucket (called Phillip, as in “fill up”) they pass around hourly. Before that happens, the set list hits some fan favorites, such as the finale from Act 1 of Les Mis, sung by four performers clutching plastic ketchup bottles like trophies. “We all moved here to be on Broadway, not serve milkshakes,” the MC says, mentioning his Broadway stints and his ongoing dreams. When he wraps, a $20 bill floats down from the mezzanine. Anyone who doesn’t tip is essentially seeing a Broadway revue for the price of a cheeseburger. “We do it because we love it, and it’s fun,” Brooks says. Still, he dreams of being a working actor, without the day job. Diner work is no one’s first choice. But for now, serving pays the bills. 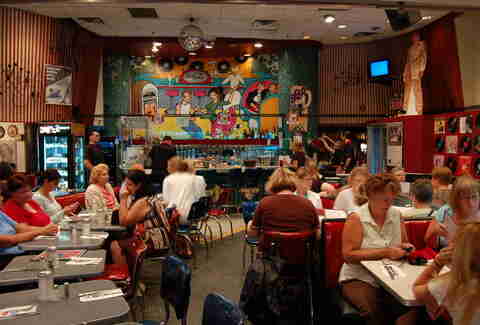 During Brooks’ second month working at Ellen’s, while he was still a host, a casting director from CBS happened to be in the diner while he sang just before close. She invited him for an audition for the network’s pilot season -- the rare instance of someone with casting power stopping in -- but nothing came of it. “No one ever comes in, which is really sad,” Brooks says. “I wish they would, because the talent in the room is great and it’s right there.” The best way to get performing work, of course, is through an agent rather than waiting to be scouted. But still, it seems like an oversight that casting directors wouldn’t come here to scoop up performers. So the servers keep at it. Some work at Ellen’s for 20 years, while others are in and out, performing in regional, touring or Broadway productions. Thanks to the union efforts, the diner lately has been accommodating working actors’ schedules, allowing them to take time off to perform. And, yet, when they’re on the clock, they seem to take it just as seriously as work on any stage in the city. Occasionally diners wait to get in only because they see a line, and surmise something awaits. Even as they pass the sign below Ellen’s awning that mentions New York’s only singing wait staff, how could they know what Broadway magic simmers inside the tin walls? “They’ll ask for us to turn the sound down and we’ll be like, ‘No, this is what we do -- we sing,’” Brooks says. “How do people not know that? Melissa Kravitz is a writer based in NYC. She wanted to be an actor but isn’t very good at waiting tables. Follow her on Twitter and Instagram and feel free to cast her in your next sitcom.